Mary "Bonnie" Baker was a 2-time All-Star. Back in Saskatchewan, Bonnie Baker's eight brothers and sisters were all catchers, so it stood to reason that Baker would become one too. She came to the AAGPBL in the Spring of 1943. Her husband was fighting overseas, but she promised him she would quit playing ball when he came home. A member of the South Bend Blue Sox, Baker, a former model, was often chosen to pose for publicity photos and act as a spokesperson. Although she was easily the most recognized AAGPBLer, glamour never stopped her from doing her job: in 1946 Baker stole 94 bases and batted .286. When her soldier husband returned home in 1946, she tried to give up baseball but it was in her blood. During the 1950 season, Baker was traded to the struggling Kalamazoo Lassies to act as player-manager -- the only AAGPBLer ever to be offered a management contract. The Lassies lost again (36-73), and, the following year, the league passed a ruling against female managers. Baker skipped the 1951 season to have a child, but returned in 1952 to play for the Lassies one more year. By Geena Davis in "A League of Their Own". St. Marys - Mary Baker, inducted into The Canadian Baseball Hall of Fame & Museum in 1998 as one of 64 Canadian women who played in the All-American Girls Professional Baseball League, died Wednesday of respiratory failure at age 84. The AAGPBL was immortalized by the 1992 movie "A League Of Their Own," starring Geena Davis, Tom Hanks, Madonna and Rosie O'Donnell. While all characters in the movie were fictitious, it has been said that Davis's character "Dottie Hinson" most resembled Baker. 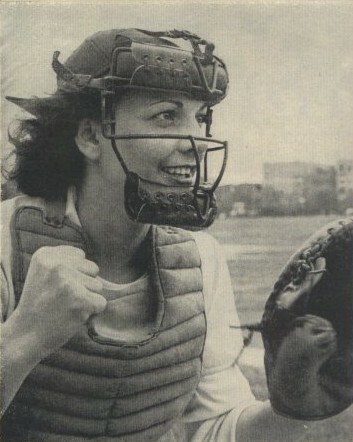 Baker was an all-star catcher who played for the South Bend Blue Sox from 1943 to 1949 before managing the Kalamazoo Lassies for three seasons. Her sister, Gene McFaul, also played in the AAGPBL. McFaul, who died last year, also played with South Bend in 1947. "Geena Davis was Mary Baker," her son-in-law Darrell Baker insists. "She was beautiful both on the outside and on the inside. She was a humble person who would do anything for anybody. She was a big fan of Canadian sports teams like the Blue Jays, Expos and the Saskatchewan Roughriders." Arleene Noga, another Saskatchewan native who played in the AAGPBL, has often represented the Canadian AAGPBL players at Hall of Fame events and threw out an opening pitch at SkyDome last year. Noga, who will turn 80 on January 1st, didn't know Baker growing up, but remembers her as "a complete player with all five tools - a real competitor." Baker, nicknamed Bonnie, is survived by her daughter Maureen (nicknamed Chick), two brothers (Andy George and Pat George), two grandchildren and two great-grandchildren. Her husband, Maurice Baker, died in 1962. She will be memorialized tomorrow at 1:00 PM at the Wascana Coutnry Club in Regina, and the family is in discussions with The Canadian Baseball Hall of Fame & Museum in regards to honouring her during the year 2004. Contributing to this article was Rob Vanstone, Sports Editor of the Regina Leader Post.